This is the perfect meal for a Sunday night. Prep was minimal, marinade was quick to make and assemblage (I love that word), was equally uncomplicated. Uncomplicated is good. And, I gotta say, Middle Eastern food is so damn good. Lemons, tomatoes, garlic, onions, cinnamon, cardamom, nutmeg, cayenne all combined for a heady sensory experience: the smell and color of the spices are exotic and deeply rich, and the tastes concurrently complex, light, and warm. Located on the East bank of the River Jordan in Western Asia, Jordan is officially known as the Hashemite Kingdom of Jordan. Jordan neighbors Saudi Arabia, Iraq, Syria and Palestine/Israel. 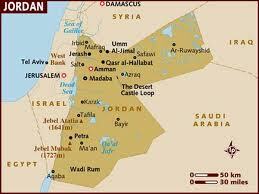 Overall, Jordan has an arid climate as found in the Arabian Desert. However, to the north is the fertile crescent, which allows for growing an interesting variety. Humus, Tabbouleh, Baklava, lamb and chicken and Arabian coffee are all staples commonly found in this beautiful country. but if you don't like your food hot, omit them. do not overcook or you'll a tough and chewy shwarma. and richness to the shwarma. Place the meat in a glass bowl. In another bowl, combine the spices, salt, garlic, Onion bay leaf, lemon jice and vinegar, stir well and pour it over the meat. Marinate in the refrigerator for at least 2 hours. Drain the meat from the marinade and pat dry. Grill the meat over a hot charcoal or gas grill until done - about 10 minutes, turning often. Divide the meat into the pita bread sections, add tomatoes, eggplant, peppers and a tablespoon or more of the yogurt. Oh my, this looks like heaven. What a treat. I love Middle Eastern food and while I just had a very nice dinner, you have me hungary.